HSVMA’s veterinary student outreach program provides students nationwide with the opportunity to learn about animal welfare issues, to participate in field and community service programs that benefit animals in need, and to participate in humane learning opportunities. 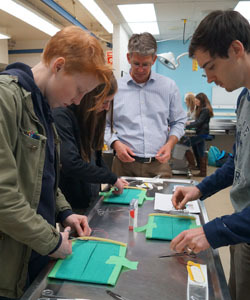 As an example of the latter, the HSVMA Student Chapter at the University of Wisconsin (UW) School of Veterinary Medicine recently hosted a cadaver spay lab and a suture lab. These educational events, now hosted annually at the school for three and four years respectively, provide veterinary students a great opportunity to develop much-needed surgical skills in an encouraging atmosphere that is designed not only for optimum learning that promotes humane veterinary training, but a little fun too. I found both the suture and spay lab to be a great opportunity for gaining hands-on experience. I personally had no prior experience in suturing and found the lab to provide a non-stressful and supportive learning environment. Both labs start off with an approximately one-hour presentation, providing the students with a synopsis of the surgical procedures that will be performed during the hands-on lab and an opportunity to ask questions. Directly following, the students proceed to the lab area and begin to embrace the tasks at hand--either honing their suture techniques using a suture board that replicates an incision site and an organ pedicle, or performing an ovariohysterectomy on an ethically-sourced cadaver (that is, bodies of deceased animals who died of natural causes or were euthanized for medical or overpopulation reasons). But the students are not left to their own devices. 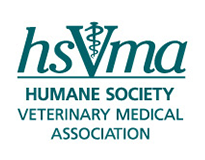 Under the watchful eye of several volunteer veterinarians, many of whom are HSVMA members, the students are able to develop and enhance their surgical skills with expert instruction from these seasoned professionals. The instruction is served with a side of good-hearted banter, easing the stress that is a common component of being a veterinary student. These events provide foundational learning for veterinary students. They walk away feeling more confident about their surgical skills, possessing the tools to practice them on their own, and empowered to better serve their future patients. I was very thankful last year for the UW HSVMA Student Chapter’s suture and spay labs—they were an invaluable preparation for my first RAVS trip as a student and first surgeries ever! I truly believe that practicing surgical techniques on teaching models or cadavers before attempting them on live animals is important to ensure patient safety and welfare, and these labs give us that opportunity far earlier in our education than we would otherwise receive. If you’re a veterinarian interested in volunteering with an HSVMA-sponsored activity at a veterinary school, or you’re a student who would like to find out more about these opportunities, please contact [email protected].